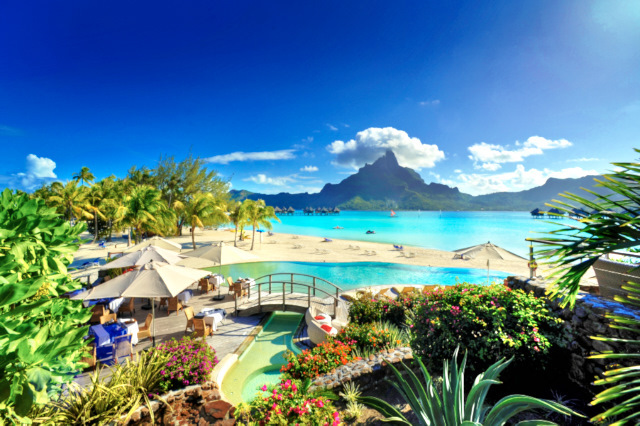 Le Meridien Bora Bora is a great combination of a modern luxurious resort, with stunning views and room prices suitable to a more modest budget. It offers over water bungalows and beach bungalows at prices less than some of the other resorts, but don't think this makes it any less luxurious! Le Meridien is in beautiful surroundings with contemporary accommodation that is sure to impress. 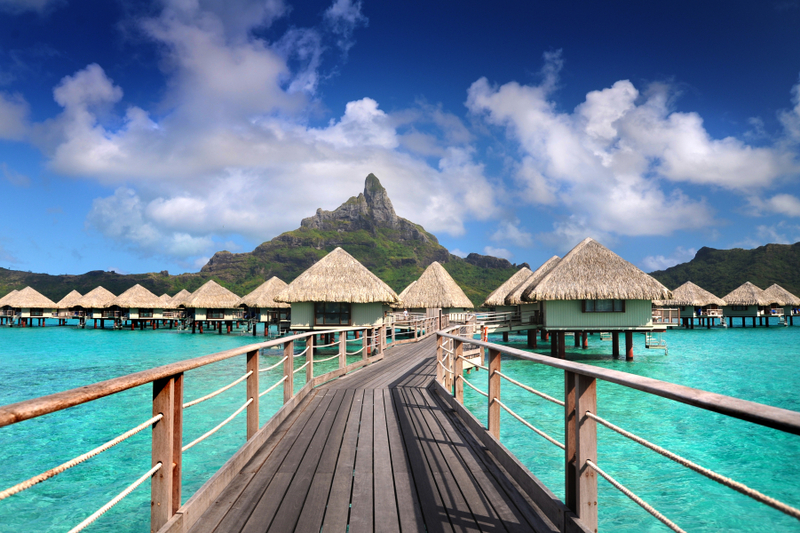 Le Meridien is one of the Bora Bora resorts on the eastern motu which looks back to grand Mt Otemanu. The views from here are breathtaking. The lagoon here is a soft turquoise and the water is calm. There's a beach, lagoon and pool at Le Meridien! 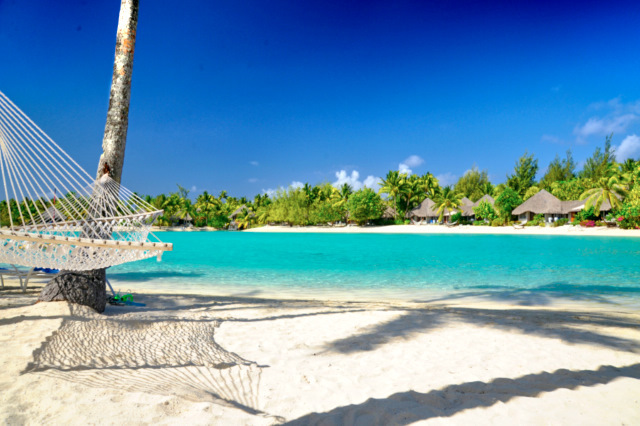 Le Meriden Bora Bora's beach is a large stretch of white sand, with hammocks and palms. Guests can dip in the lagoon, the inner lagoon and the pool all within a few sandy steps. So it is a water lovers paradise. 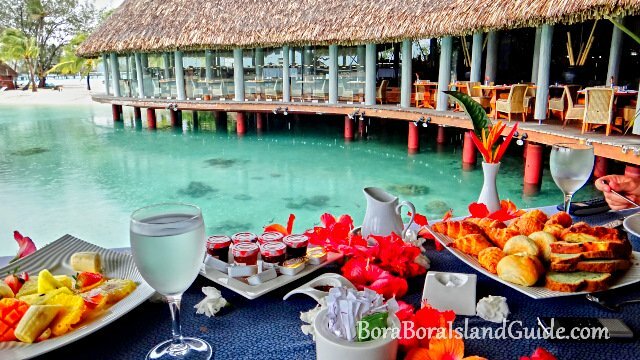 At the Le Meridien Bora Bora you can dine right next to the lagoon and watch the colorful fish swim by as you chomp on your french delicacies. We feasted at breakfast time next to Le Meridien's lagoon. The best of Le Meridien's over water bungalows have views to Mt Otemanu. All of the bungalows have been renovated and are beautifully contemporary inside, with a touch of Polynesian charm. 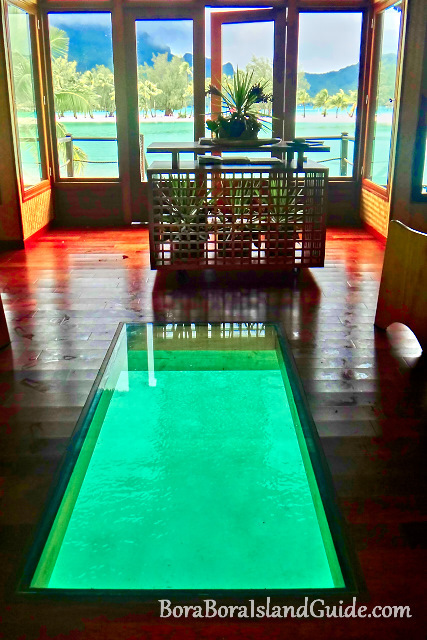 The over water bungalows have large glass floors so you can enjoy seeing the marine life swim past. 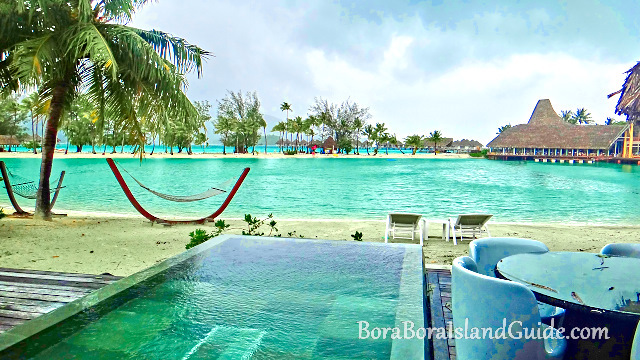 For a less expensive option, choose a beach bungalow in Bora Bora. The beach bungalows at the Le Meridien are set around the inner lagoon. These are very spacious inside, and offer more areas to relax around the bungalow. 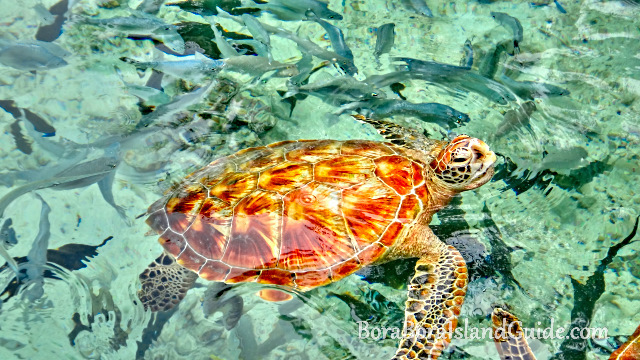 Le Meridien is the only resort in Bora Bora with on-site turtles! They have a turtle sanctuary which helps injured turtles needing care. The sanctuary allows observation and education of the turtles for guests. 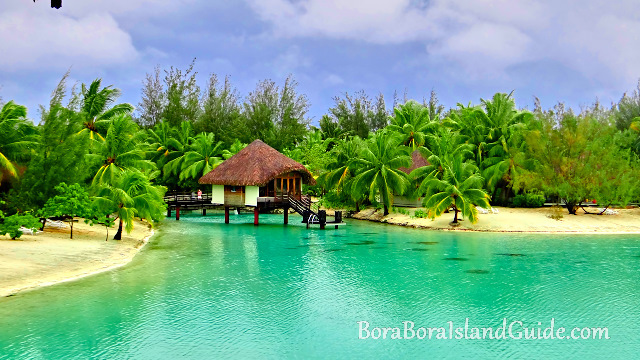 Getting Married in Bora Bora? Le Meridien has an over water chapel which allows you to walk down the aisle over the lagoon! If you are considering getting married in Bora Bora, read about why a Bora Bora wedding is different to any other, and how to plan and choose your wedding in this unique location. 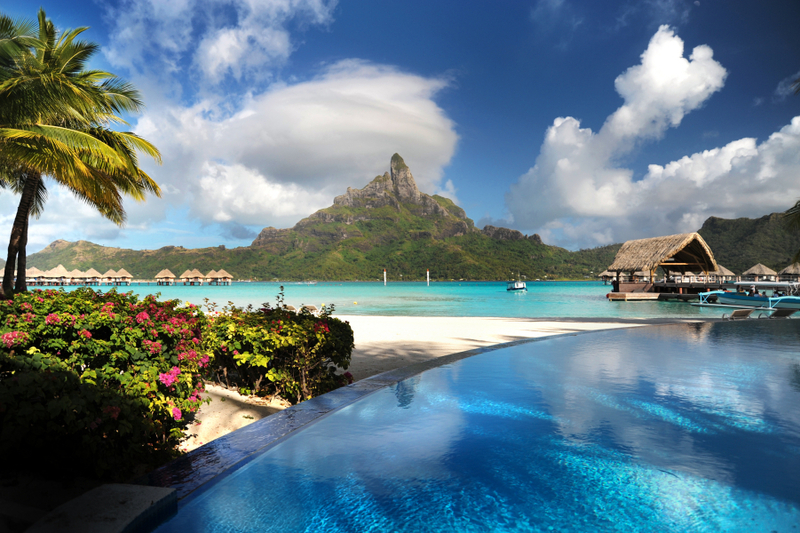 Le Meridien is in a beautiful location on Bora Bora, with stunning views. The hospitality of the staff was warm and elegant. The bungalows are fresh and modern. The over water bungalows have large glass areas for viewing the lagoon below. The beach bungalows are spacious. Le Meridien is on the same motu as the Intercontinental Thalasso resort, so you can walk down the motu to experience the unique Thalasso Deep Ocean Spa. For a special dining treat guests can organize to visit the sister resort, the St Regis, and experience "Lagoon" ,known as the best restaurant in Bora Bora.